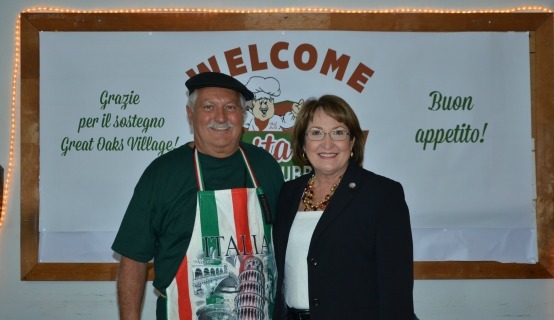 Mayor Teresa Jacobs recently joined Orange County Public Works for the 5th Annual Pasta with a Purpose, an employee luncheon that benefits the children of Great Oaks Village (GOV). GOV is a residential foster group home for children, 6 to 18 years old, who have been removed from their homes by the State of Florida due to abuse, neglect or abandonment. Orange County’s Director of Public Works Mark Massaro oversees the annual fundraising event, which sold out this year with over 300 attendees. Public Works organizes several different fundraising events for GOV throughout the year, but Pasta with a Purpose is by far the division’s largest fundraising event. Pasta with a Purpose raised $2,200 last year, and Massaro estimates this year’s proceeds could reach $3,000. Vicki Dalton, the Multimedia Special Projects Coordinator for Public Works, said the donations and money raised from the event go toward extra curricular activities for the children of GOV. Public Works is composed of over 500 employees and seven departments including development engineering, public works engineering, highway construction, traffic engineering, road and drainage, storm water management and fiscal and operational support. Each of these departments coordinates their own fundraisers to raise funds for United Way and GOV. Some of the events from past years include chili cook-offs, dinner and a movie tickets and a yard sale.